Was the Las Vegas murderer an anti-gun bigot? A special "Thank you" to M.L. whose thank you note kept bouncing. Any and all donations and subscriptions are greatly appreciated! A few days ago, my daughter was playing some online games, and came across one she has decided to hate. When she saw it she said "I wish they would ban that game!" I asked if it wouldn't be better to just not play it if she doesn't like it. Leave it there for the people who do like to play it. I asked "How is it hurting you?" This is how statism gets a grip. It's too easy to call for something you don't like to be banned. 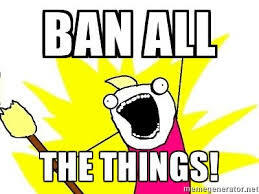 Even if something is wrong or harmful, banning it isn't the proper way to deal with it. She moved on, and later even played the game she had wanted banned, with a friend. I really try to not lecture-- although she considers anything I say to be a lecture. I hope she is learning to figure these things out for herself.